SANTA ANA, California, May 10, 2018—Nicalis, Inc. today announced that Crystal Crisis, a cute and colorful new color-matching combat game, is coming to Nintendo SwitchTM in the fall of 2018. Developed and published by Nicalis, Crystal Crisis is presented like a one-on-one fighting game, but instead of pressing buttons to kick and punch, players arrange falling gems into matching colors to clear them from the screen and inflict damage on their opponents. It’s the ultimate puzzle battle throwdown! By matching gems and unleashing combos in Crystal Crisis, players can build up their “burst gauge” which can trigger powerful, board-breaking hits that will leave opponents in pieces. The innovative new “wrap-around” feature lets players move a falling piece beyond the edge of the playfield to reappear on the other side; you can even divide it into two separate gems by allowing it to drop while the two halves are straddling the border. A variety of different modes (including Arcade, Survival, Tag-Team and Training) accentuate the battle options, while local and online multiplayer functionality give challengers the opportunity to play against friends, family members and Crystal Crisis warriors worldwide! 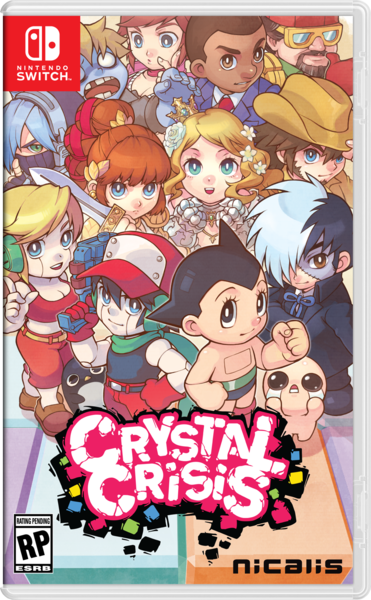 Crystal Crisis for Nintendo Switch will be available digitally and physically in Fall 2018 for $39.99 MSRP. Like all of the retail games that Nicalis has previously published for Nintendo Switch, the launch edition of the physical version will include a full-color instruction booklet and a yet-to-be-announced bonus collectible. Yiiiikes $40 is a lot of cash for a game like this. Looks like fun don&apos;t get me wrong but I can&apos;t justify spending that much on a puzzle game when there are so many alternatives for far cheaper. This is the most surreal set of crossover characters I think I&apos;ve ever seen. Developed and published by Nicalis, Crystal Crisis is presented like a one-on-one fighting game, but instead of pressing buttons to kick and punch, players arrange falling gems into matching colors to clear them from the screen and inflict damage on their opponents. So, it&apos;s a Super Puzzle Fighter II Turbo clone?